Soil test based nutrient management concept was adopted by the farmers due to KVK's intervention like providing technical guidance, input and services. However, many times due to problems like high pH and EC, high calcium content in soil and low organic carbon content, the uptake of nutrients was very low. This has resulted in various nutrient deficiencies in the plant leading in reduction in the yield and quality of crop. Due to deficiencies of some plant nutrients, some other plant nutrients uptake is more leading to abnormal growth of the plant. 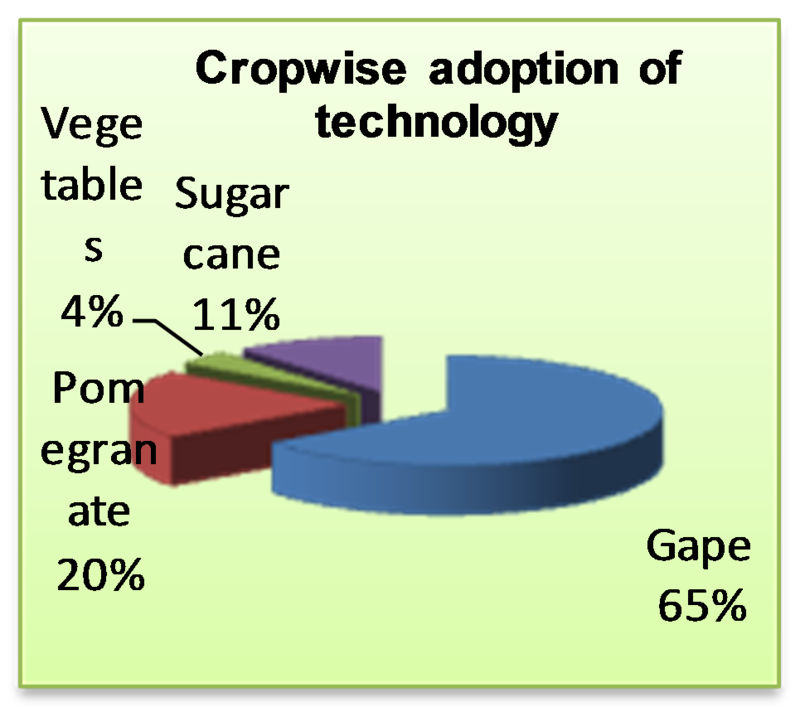 In high value crops, particularly horticulture crops like grape, pomegranate and vegetables, there are huge losses to the farmers. All these problems cannot be identified without testing and diagnosis of plant tissue. Through tissue testing it can easily understand the nutrient status in the plant. After considering the problem and opportunities, the KVK started plant tissue analysis and advisory services. Tissue analysis based nutrient management concept was initiated by the KVK in the year 1998. It was observed that after diagnosis of nutrient status in plant, it was very difficult to rectify the deficiencies symptoms by using the conventional fertilizers. Due to poor soil properties, the availability and uptake of the nutrients by the plant through the conventional fertilizers was very less. Therefore, the soluble fertilizers and foliar feeding concept was introduced by the KVK in the district during the year 1999. There is considerable reduction in the problem of flower drops, setting of flowers and fruits besides improvement in uptake of nutrient in different high value horticulture crops. Grape and pomegranate farmers have harvested export quality produce and secured 25 per cent higher market price. Due to availability of the plant tissue diagnostic services, the activity of foliar feeding and fertigation of plant nutrient through drip an innovative practice. The rectification of nutrient deficiencies can easily be done immediately by adopting this new concept. The farmers especially grape and pomegranate growers from the seven tehsils of the Ahmednagar district and the three intensive grape growing tehsils of Nasik district are benefited through these services. More than 1000-1200 farmers are approaching KVK to get these inputs and serves. The tissue test based nutrients management concept increased the net income by Rs.6000-8000/ha in cash crop and 2500-3000 in other crops Tissue analytical services have started in Soil Testing Laboratories of other districts with the technical guidance and motivation of the KVK.